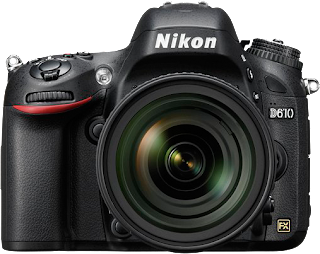 Today Nikon announced the successor of the affordable Nikon D600 full frame camera. The most notable updates of the D610 are improved improved white balance and shutter mechanism (with new quiet continuous shooting options and a slightly higher frame-rate). The Nikon D610 will be available in the shops from 18 October at a price of around $1999/€1969. Approx. 141 x 113 x 82 mm/ 5.6 x 4.4 x 3.2 in. * PictBridge is a trademark. * The SD, SDHC and SDXC logos are trademarks of the SD-3C, LLC. * HDMI, the HDMI logo and High-Definition Multimedia Interface are trademarks or registered trademarks of HDMI Licensing, LLC. * Google, Android and Google Play are registered trademarks or trademarks of Google Inc.
* Wi-Fi is a registered trademark of the Wi-Fi Alliance®. * Products and brand names are trademarks or registered trademarks of their respective companies.